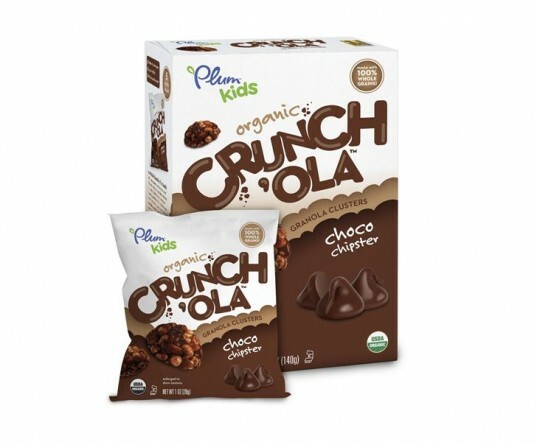 You're probably familiar with Plum Organics' line of certified organic foods for babies and young toddlers -- but now the company is appealing to a wider age group of children with their brand new line of snacks geared especially for older kids. The entire new Plum Kids line is certified organic and the snacks are perfectly sized and packaged for lunch boxes, after school treats or anytime snacking. Keep reading to see the new offerings in Plum Kids product collection. Crunch‘ola are yummy bite-sized granola clusters of nutrition made with four hearty whole grains including Millet, Quinoa, Brown Rice and Oats. These certified organic snacks contain 3 grams of fiber per serving and zero high fructose corn syrup, trans fats, artificial flavors or preservatives. Three flavors including choco chipster, apple and peanutty pretzel are available in 100% BPA-free packages. 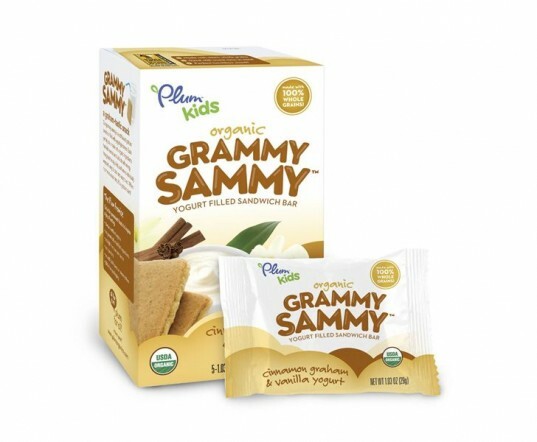 Grammy Sammy snacks are soft baked graham bars filled with organic yogurt in various flavors (vanilla, banana, strawberry). Each individually wrapped bar is packed in BPA-free packaging and made with nourishing ingredients like whole grains, and organic fruit and yogurt, plus have no added trans fats, high fructose corn syrup, artificial flavors or preservatives. Jammy Sammy is a snack size twist on the old PB&J. Made with certified organic ingredients, whole grains and real fruit, this is a healthy nourishing snack for kids. Comes in 100% BPA-free packaging in a recycled box and available in four fun flavors including apple cinnamon, blueberry, grape jelly and peanut butter and strawberry jam and peanut butter. Plum Kids Mashups come in various choices, including fruit and veggie smoothies made from 100% real organic fruits and veggies mixed and mashed into purees kids can squeeze and eat. One such option is Greek yogurt, comprised of tangy, creamy Greek yogurt and sweet fruits. The unique Morning Mashups, a line of squeezable oatmeal that blends whole grain oats and protein from quinoa with fruit is perfect for breakfast. All of the mashups are spoon-free for easy eating on–the-go, and they contain zero trans fats, high fructose corn syrup, or artificial ingredients. The pouches are all BPA-free, resealable, portable and recyclable. Mashups are available in a slew of great flavors (14 in all). 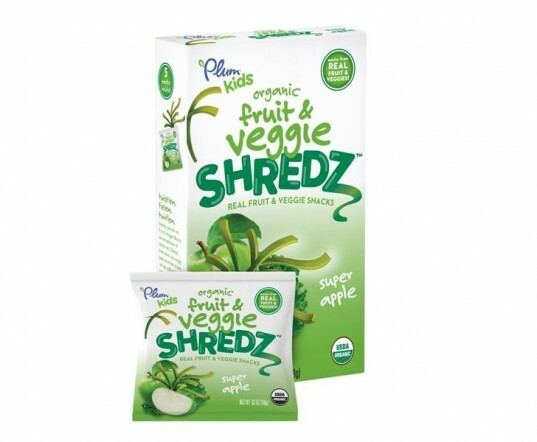 Fruit & Veggie Shredz are a unique product for kids that include a full serving of fruit in each little BPA-free packet. The shredz are a mix of fruits and veggies that kids can twist, tie and twirl. These contain no artificial flavors and zero high fructose corn syrup. Available in four fantastic flavors including berry, peach, apple and blueberry. Yo’ Drops are super fun freeze-dried crunchable drops of organic yogurt and real organic fruit served up in BPA-free and recycled pocket-friendly pouches. These have no artificial flavors, trans fats or high fructose corn syrup and are sure to be a kid favorite. Comes in mango, strawberry banana and berry. Crunch'ola Crunch‘ola are yummy bite-sized granola clusters of nutrition made with four hearty whole grains including Millet, Quinoa, Brown Rice and Oats. These certified organic snacks contain 3 grams of fiber per serving and zero high fructose corn syrup, trans fats, artificial flavors or preservatives. Three flavors including choco chipster, apple and peanutty pretzel are available in 100% BPA-free packages. Grammy Sammy Grammy Sammy snacks are soft baked graham bars filled with organic yogurt in various flavors (vanilla, banana, strawberry). Each individually wrapped bar is packed in BPA-free packaging and made with nourishing ingredients like whole grains, and organic fruit and yogurt, plus have no added trans fats, high fructose corn syrup, artificial flavors or preservatives. 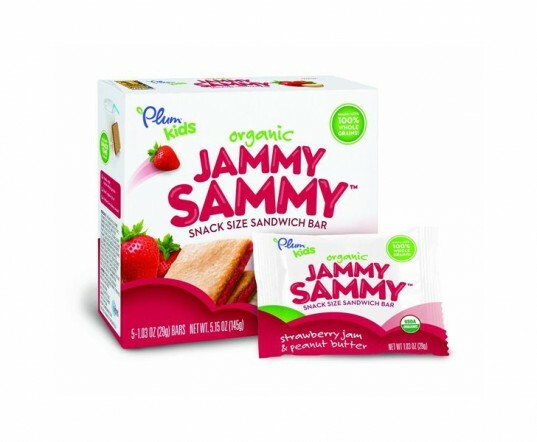 Jammy Sammy Jammy Sammy is a snack size twist on the old PB&J. Made with certified organic ingredients, whole grains and real fruit, this is a healthy nourishing snack for kids. Comes in 100% BPA-free packaging in a recycled box and available in four fun flavors including apple cinnamon, blueberry, grape jelly and peanut butter and strawberry jam and peanut butter. 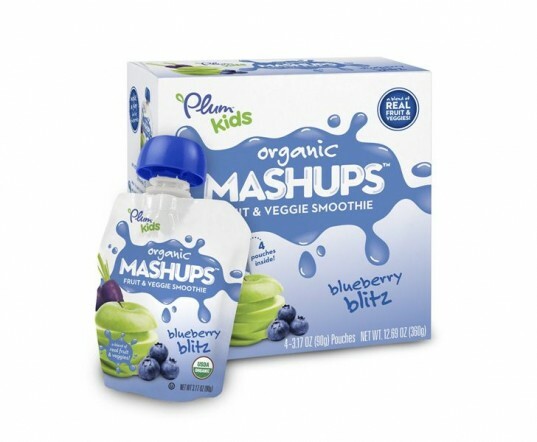 Mashups Plum Kids Mashups come in various choices, including fruit and veggie smoothies made from 100% real organic fruits and veggies mixed and mashed into purees kids can squeeze and eat. One such option is Greek yogurt, comprised of tangy, creamy Greek yogurt and sweet fruits. The unique Morning Mashups, a line of squeezable oatmeal that blends whole grain oats and protein from quinoa with fruit is perfect for breakfast. All of the mashups are spoon-free for easy eating on--the-go, and they contain zero trans fats, high fructose corn syrup, or artificial ingredients. The pouches are all BPA-free, resealable, portable and recyclable. Mashups are available in a slew of great flavors (14 in all). Shredz Fruit & Veggie Shredz are a unique product for kids that include a full serving of fruit in each little BPA-free packet. The shredz are a mix of fruits and veggies that kids can twist, tie and twirl. These contain no artificial flavors and zero high fructose corn syrup. Available in four fantastic flavors including berry, peach, apple and blueberry. 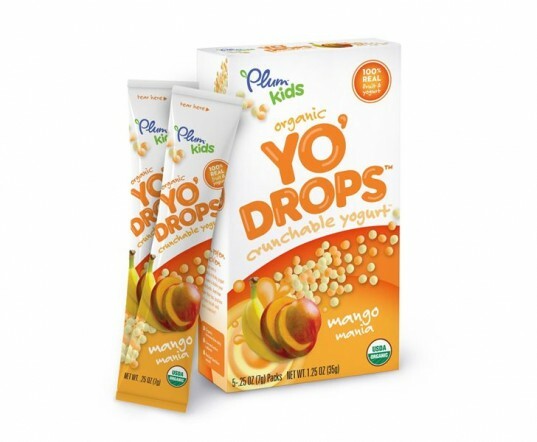 Yo' Drops Yo’ Drops are super fun freeze-dried crunchable drops of organic yogurt and real organic fruit served up in BPA-free and recycled pocket-friendly pouches. These have no artificial flavors, trans fats or high fructose corn syrup and are sure to be a kid favorite. Comes in mango, strawberry banana and berry.